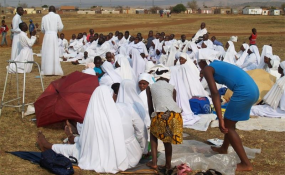 Ministry of health officials in Murewa have for the second time in less than a month called in the police to shut down a popular Johanne Marange apostolic sect shrine in the area following the death of four members, including the sect leader, from cholera. Last week, three people died at the Chitsidzo Shrine in Nyamutamba while another sect member died at Murewa Hospital where he had been admitted. The latest deaths bring to eight the total number of sect members and patients who have succumbed to death from cholera at the shrine inside a month. In mid-December, four members died at the same shrine before health officials also sought the assistance of the police to move in and close the shrine. This is after thousands of church members had gathered for their annual holy communion. A senior Mashonaland East police officer, confirmed that officials from the health ministry have since sought assistance from the police to close the shrine and avert further outbreaks and deaths. "I can confirm that police officers in Murewa have since moved in to assist ministry of health officials in closing down the shrine and disperse everyone gathered there. Senior police officials from the province are also on the way to the shrine to assess how best we can stop further outbreaks," he said. According to Mashonaland East provincial epidemiologist, Paul Matsvimbo, first to die at the shrine last week was a child who was being treated for an unknown ailment by the sect leader. Soon after, the sect leader also died followed by his aide while the fourth person died in hospital. Matsvimbo said a cholera reaction team had been set up at the nearby Nyamutumbu clinic to treat any new cases while the Murewa district Civil Protection Unit was mobilising resources.